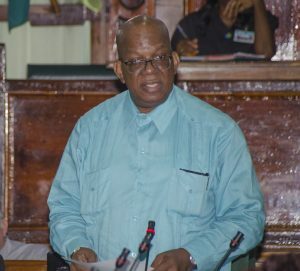 11 laws will be amended to support tax provisions made in budget 2017, and those proposed amendments were tabled by Finance Minister Winston Jordan in the National Assembly on tuesday. Provisions to be amended included those within the Motor Vehicles and Road Traffic Act; Customs Act; VAT Act; Capital Gains Tax Act; Corporation Tax Act; Income Tax (In Aid of Industry) Act; Income Tax Act; Intoxicating Liquor Licensing Act; Miscellaneous Licenses Act; Tax Act; and the Travel Voucher Tax Act. The Finance Minister had promised to have those proposed amendments printed and presented in the National Assembly by Tuesday afternoon, however, failure to do so prompted Opposition Chief Whip Gail Teixeira to remind the House tuesday evening of the Finance Minister’s commitment. Opposition Chief Whip Teixeira during a press conference yesterday afternoon explained the Bills still were not presented to the House. Opposition Leader Bharrat Jagdeo, during that press conference, touched on the impact of the still-to-be-amended laws on budget 2017 provisions. Jagdeo questioned, as throughout budget debates, one of the proposed amendments to the Value-Added Tax laws which would possibly see the Guyana Revenue Authority garnishing taxpayers’ bank accounts without a court order, similarly barring tax defaulters from leave the jurisdiction. “I think they may back down on a few of these things,” the Opposition Leader continued. The National Assembly resumes Sittings on January 5, 2017 to deliberate on the proposed laws to be amended. Jagdeo said all of the budget’s measures would not be effective from January 1, but instead from February 1.